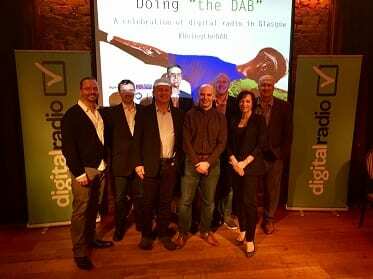 Glasgow’s thriving digital radio scene was celebrated at a special event, Doing the DAB, attended by broadcasters from BBC, commercial and community radio at 29 Private Members’ Club in central Glasgow this evening, just two days after it was announced that Glasgow will host the BBC’s 6 Music Festival next month. The event was hosted by Stuart Barrie, Chair of Radio Academy Scotland and East Scotland Regional Content Director of Bauer Media, and heard from a number of Glasgow’s leading broadcasters. BBC Radio Scotland’s Sharon Mair, Editor Radio Events Music & Partnerships, shared her insight on the success of the digital pop-up station, BBC Radio Scotland Music Extra, as well as more details on the upcoming 6 Music Festival which will feature content and programming highlights created in collaboration by BBC Scotland and BBC Radio 6 Music. Speaking at the event, Ms Mair, said: "I am delighted that BBC Scotland and BBC Radio 6 Music are working closely together to bring fantastic music to our audiences during the Fringe and Festival, including a very special Quay Sessions simulcast on both networks featuring one of Scotland’s most influential musicians, Edwyn Collins. We would like to thank all the local partners, venues, promoters and Glasgow City Council for their fantastic support and we look forward to working with them." Further event highlights included news of the on-going innovation and investment in digital radio taking place in Glasgow, where the imminent launch of four new services will take the total number of radio stations available on DAB to over 70. Ciaran O’Toole, founder of Rock Radio, announced that the new Rock Radio station, which was awarded the Glasgow/West Central FM licence in October, will begin digital streaming transmissions this summer prior to its launch on FM in the autumn and that options for DAB availability are being explored. Brave Broadcasting Director, Spencer Pryor, announced that three new stations will be launched this year on DAB in the Glasgow city area as part of Ofcom’s small scale DAB trial, with the first being Colourful Radio. Richard Bogie, General Manager of News Scotland, discussed the success of News Scotland’s recent pop up digital station, The Scottish Sun Christmas Radio, which was launched in collaboration with Wireless Group following its acquisition by News UK, commenting: "We were absolutely delighted with the results of The Scottish Sun Christmas Radio which was our first collaboration with Wireless Group. There is clearly a listener and client demand for this type of brand extension and we have an appetite for more activity with our radio colleagues." Graham Bryce, Group Managing Director, Bauer City Network, highlighted the innovation in content that DAB has enabled, saying: "It’s great to see such a fantastic celebration of digital radio in Glasgow. DAB allows the whole industry to relentlessly innovate - listeners love it, and it's enabled a new era in radio content. From our local Clyde brands in Glasgow, to the launch of national digital stations like Kisstory, Mellow Magic and Magic Chilled - today, 56% of Bauer’s total radio listening is delivered via a digital device which demonstrates just how much listener behaviour is changing." Also taking the stage at the event to share insights into digital radio growth and opportunities were Piers Collins, Strategic Development, Legal & Business Affairs at Wireless Group which runs the Central Scotland Switch Digital multiplex; Adam Findlay, Group MD of New Wave Group which owns Central FM; and Ford Ennals, CEO of Digital Radio UK. Ford Ennals, CEO of Digital Radio UK, said: "Glasgow is one of the most dynamic radio markets in the UK and it’s great to see and hear the excitement about digital radio in Glasgow from the BBC, commercial and community radio. With so many new digital stations and such strong digital growth it is only fitting that this year’s Music Festival from the leading digital-only station BBC 6 Music is happening in Glasgow." Over the last five years digital listening has more than doubled in Glasgow now accounting for 43% of all radio listening and 54% of Glasgow homes now own a DAB radio. Thirty new stations have launched in Glasgow on DAB in the last year, making it among the most dynamic radio markets in the UK, driven by the launch of 19 national stations on the second national commercial DAB network and the launch of the Glasgow Ofcom small-scale DAB multiplex. The small-scale DAB multiplex was launched in September 2015 and is one of ten across the UK that forms part of an extended trial by Ofcom and the Department for Culture, Media and Sport. There are 11 local, community and special interest stations currently broadcasting on the Glasgow mini-mux , which is operated by Brave Broadcasting, including Blast!, GO Radio Glasgow, Gaydio, Celtic Music, Radio Caroline, Radio Saltire, Radio Telstar, Starpoint Soul, Sunrise Radio, Timeless Radio and YOUR Radio. As well as new station launches, digital radio in Glasgow has been transformed by the expansion of local DAB coverage bringing the city’s 11 local services - Clyde 1, 2 and 3, BBC Scotland, Capital Scotland, Heart Scotland, Smooth Radio, KISS Fresh, Absolute Classic Rock, Absolute Radio 90s and Magic Soul - to over 500,000 more listeners in the past 12 months. Four new transmitters have already been switched on with a final two due to launch later this year, bringing a further 100,000 listeners into coverage, completing a programme of work to increase local DAB coverage from 72% of households in Glasgow to 95%. Doing the DAB was hosted by Radio Academy Scotland, Digital Radio UK and Radio Today, and supported by manufacturer Revo, Radioplayer and Hyde Park Corner Installers.